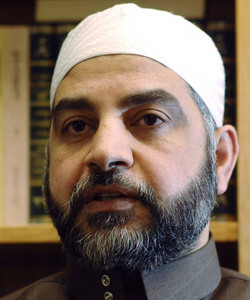 Imam Mohammad Qatanani of the Islamic Center of Passaic County in New Jersey prayed for the HLF defendants in a July 2007 sermon. Qatanani can be heard speaking Arabic in the background while someone translates his sermon into English in real-time. Qatanani: Oh Allah assist our brothers and sisters in Filastin, and Iraq and Chechnya. O Allah remove occupation and oppression and oh Allah improve the matters of our community, subhanahu wa ta'ala to assist our brothers and sisters in the Holy Land Foundation, ask oh Allah subhanahu wa ta'ala to assist them and to remove the difficulty that they have been inflicted with with all of the brothers and sisters in this country, oh Allah to prove them non-guilty.